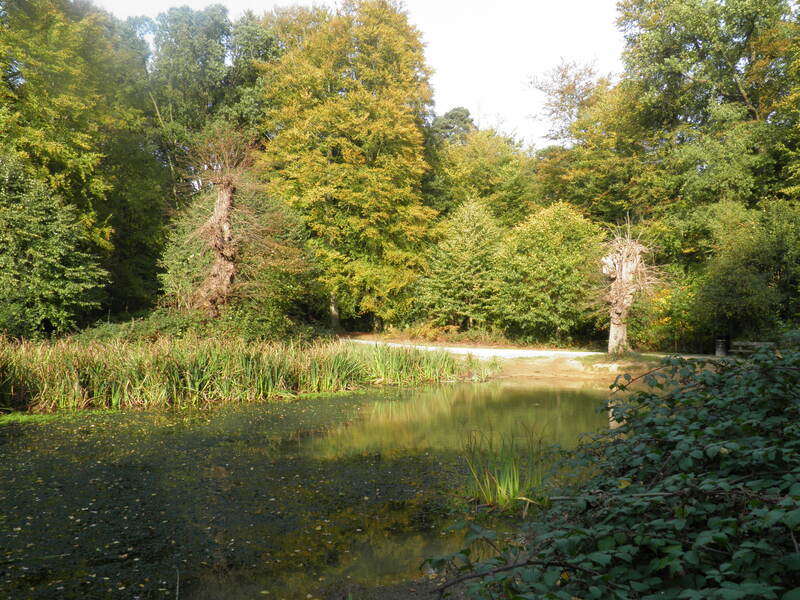 Linking historic villages along the sylvan Chess valley and into the beech woods of the Chiltern Hundreds (at their best in early autumn), this stunning, easy walk encompasses water meadows, commons, 15th century manor houses and hill-top pastures. All starting from a London Underground station. Underfoot: Well-trodden paths, mainly firm in all weather conditions, though some woodland and riverside sections could be muddy after heavy rain. Terrain: Frequent ascents and descents, but all are either very gentle, or short and steep. Maps: 1:50,000 Landranger 165 Aylesbury & Leighton Buzzard and Landranger 166 Luton & Hertford; 1:25,000 Explorer 172 Chiltern Hills East and Explorer 182 St.Albans & Hertford. Getting there: Chalfont & Latimer is on the London Underground Metropolitan Line, served by trains towards Amersham or Chesham. 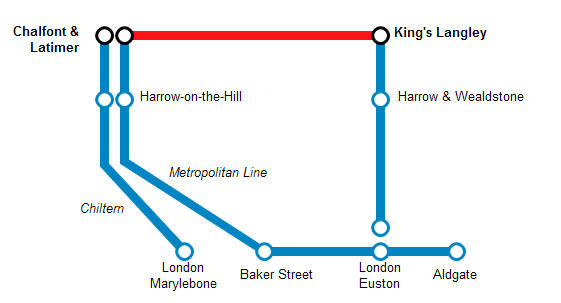 Trains run daily 4 times per hour from Baker Street (41 mins) via Harrow-on-the-Hill (22 mins). Alternatively, Chiltern Railways run faster trains 2 times per hour Monday-Saturday (1 train per hour Sundays) from London Marylebone (31 mins), also via Harrow-on-the-Hill (18 mins). Note that the Metropolitan line (and Chiltern services which share the route) are currently prone to disruption at weekends due to engineering works. Check before travel. 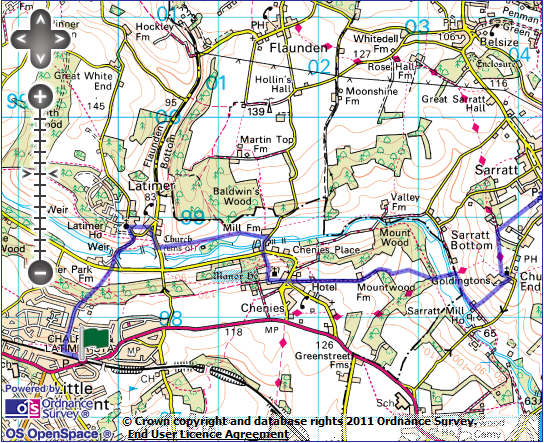 Useful websites: Parts of this route follow the waymarked Chiltern Way and Hertfordshire Way. 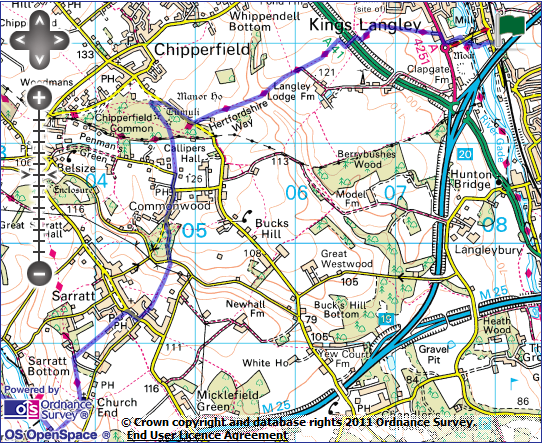 The route passes Chenies Manor House and crosses Chipperfield Common. Getting home: Kings Langley is served by 2 London Midland trains per hour Monday-Saturday (1 train per hour on Sundays) to London Euston (27 mins) via Harrow & Wealdstone (13 mins). Fares: The cheapest option based on a journey starting in central London is likely to be two single tickets – from other areas it may be cheaper to use a combination of Travelcards and single tickets. Whether you travel to Chalfont & Latimer by Underground or Chiltern Railway, Oyster Pay-As-You-Go will cost £3.50 off-peak (Under 10s travel free on Underground, £1 on Chiltern, 11-15 £1 via either route). A Kings Langley – Euston off-peak single costs £9.40 (child £3.50, railcard £6.20). Arriving at Chalfont & Latimer station from the London direction, pass through the subway and exit through the ticket gates. Take the steps straight ahead (marked ‘Private Footpath to Bedford Avenue’), cross the car park, and turn left on suburban Bedford Avenue. At the first junction, turn R and continue straight over the first crossroads along Chenies Avenue. Along here you pass an intriguing cross-section of Metroland architecture, from the 1920s villa to the copy-book 1990s semi. Chalfont & Latimer stations in fact serves three ‘Chalfonts’: Chalfont St Giles, Chalfont St Peter and Little Chalfont, where you are currently. There was basically nothing here prior to the twentieth century – the station (then called Chalfont Road) opened in 1889 amongst fields. This was archetypal Metroland: where the Metropolitan Railway’s business plan depended heavily on selling the development land around their new stations. 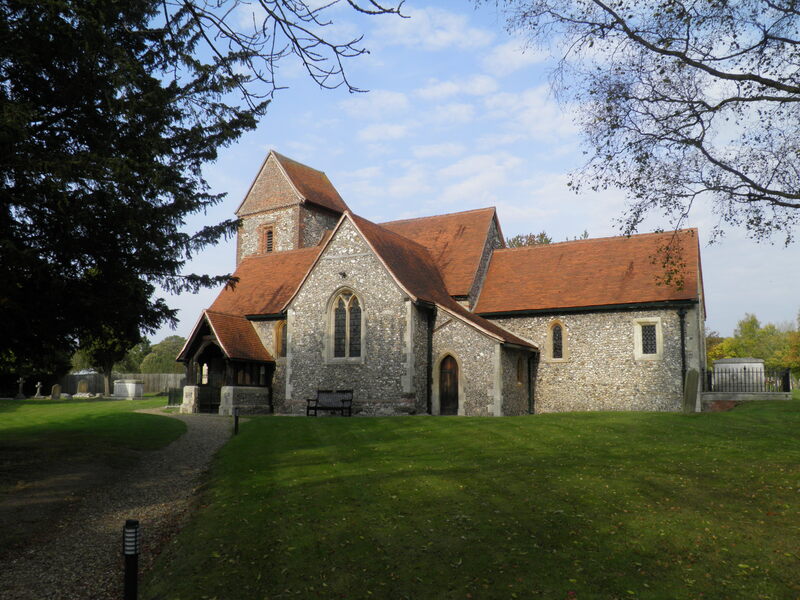 In this case it took some while: it was not until 1925 that the name Little Chalfont first appeared. At the next crossroads continue straight ahead, the road becoming a gravel track past large houses that abruptly ends, an unmarked path ahead plunging straight into the beech woods. continue on the path straight ahead. The path drops through the woods, crosses a wider path and continues to descend towards Park Farm, glimpsed ahead through the trees. 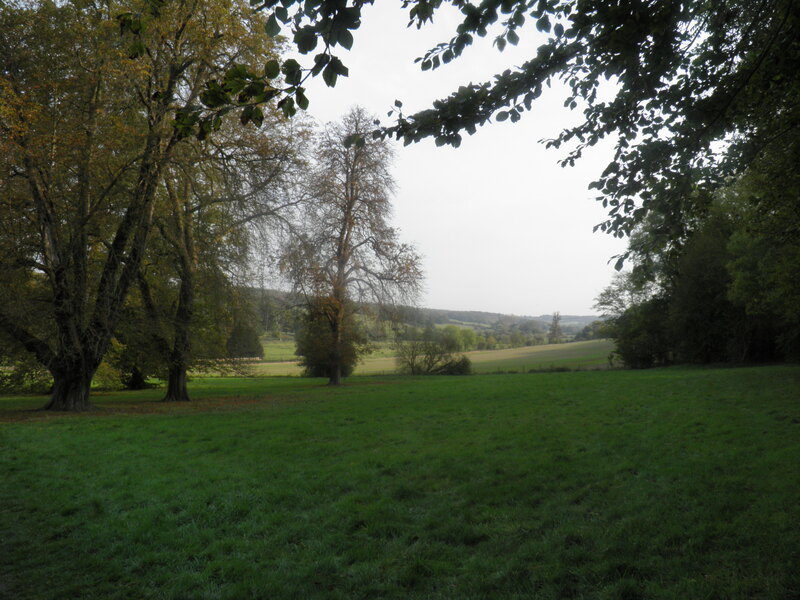 You emerge into the open valley floor of the Chess, Latimer House imposing over it on the hill ahead, pass through a kissing gate, across a field to reach the busy road along the valley. 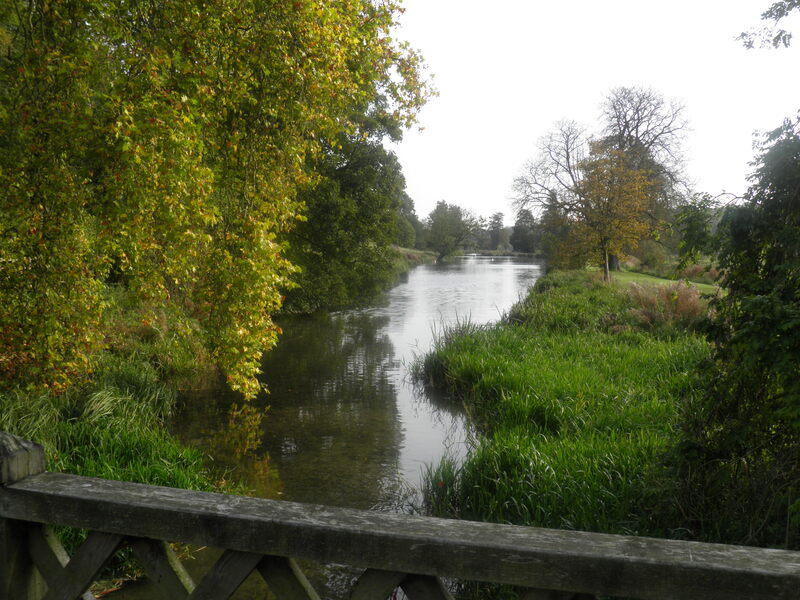 the weed-choked river and then across the beautiful artificial channel that stretches down the valley, feeding mills and, to your left, producing an ornamental lake for Latimer House, dammed by the weir you see here. Latimer House, on the hill above, is on the site of an Elizabethan manor in which both Charles I was imprisoned en route to his trial in Westminster and his son took refuge before fleeing to France. The brick mansion now in its place dates from the 1860s and housed the Joint Service Defence College for much of the 20th century, now being a conference centre. the footpath sign. The path descends the field towards the clustered houses of Latimer village, to emerge on its stunning triangular village green, surrounded by 17th and 18th century houses. 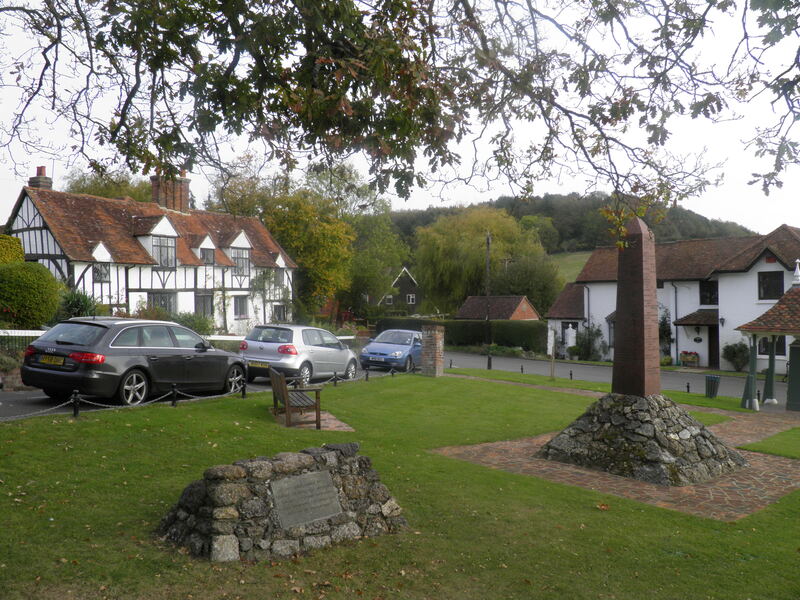 The obelisk in the centre of the green is a Boer War memorial, placed here due to one of the Barons of Chesham – the title of the Cavendish family of Latimer House – was a commander during this war. Intriguingly, his horse is buried under the stone mound next to the obelisk. 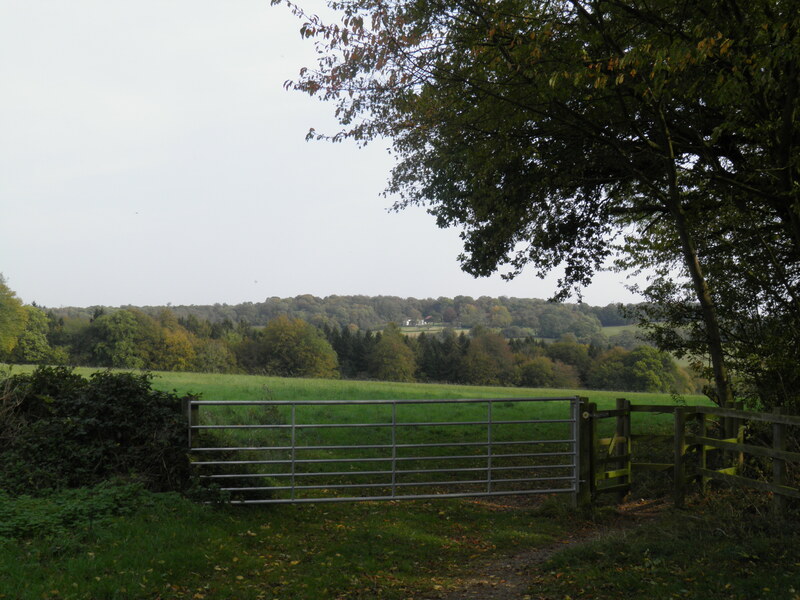 At the bottom of the green, turn right on the road leading past the old schoolhouse and after about 50m turn left on the footpath marked as both the Chiltern Heritage Trail and the Chess Valley Walk. This leads onto a clear path along the meadows on the valley floor. Along this path you pass the altar-like Liberty Tomb, the grave of a William Liberty (a relative of the department store family), buried here in 1777, close to his now non-existent mansion. footpaths opposite, climbing quite steeply through the beech wood. The path leaves the wood between hedges and then runs between two ancient walls, with the ornamental chimneys of Chenies Manor at the end. You emerge by the gates of Chenies Manor, with the flint-knapped church on the left. 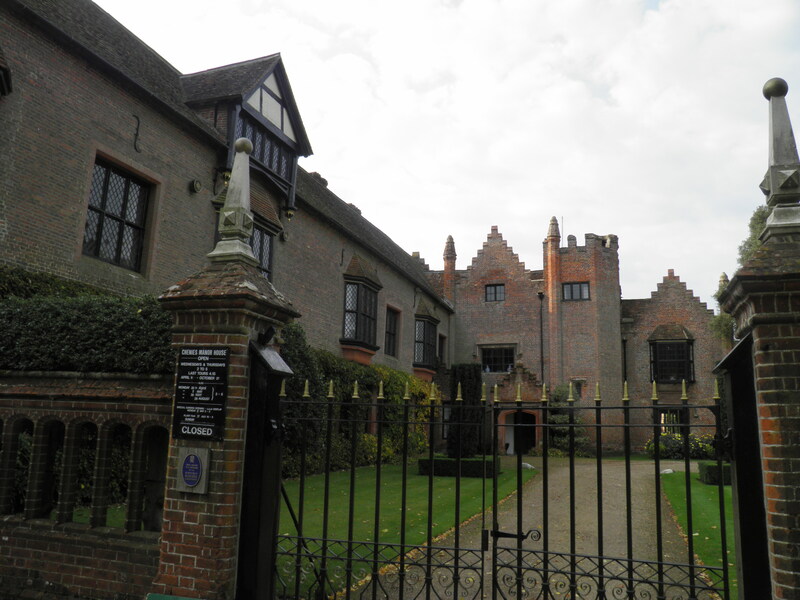 Much of the current Chenies Manor dates from around 1460, built by Sir John Cheyne, whose family managed to have the whole village – which is clearly an estate village- named after them. It is particularly noted for its decorative cut brick chimneys, of which it has 22, and its remarkable gardens – which contain two mazes. The manor has, like much of the Chilterns, been used as a location for Midsomer Murders and also in the House of Cards trilogy. Opening hours are very limited: Wednesdays, Thursdays and Bank Holidays during the summer. Turn left down the manor’s gravel drive to another superb village green in the centre of Chenies village. Take the road straight ahead cutting across the green and take the small road ahead between whitewashed number 28 and brick May Cottages. Follow this straight hilltop lane for around 1 mile, through the gates to Mountwood Farm. the farm buildings, you rejoin the track. After another gate, the track becomes fainter and twists down the hill between the beech woods. 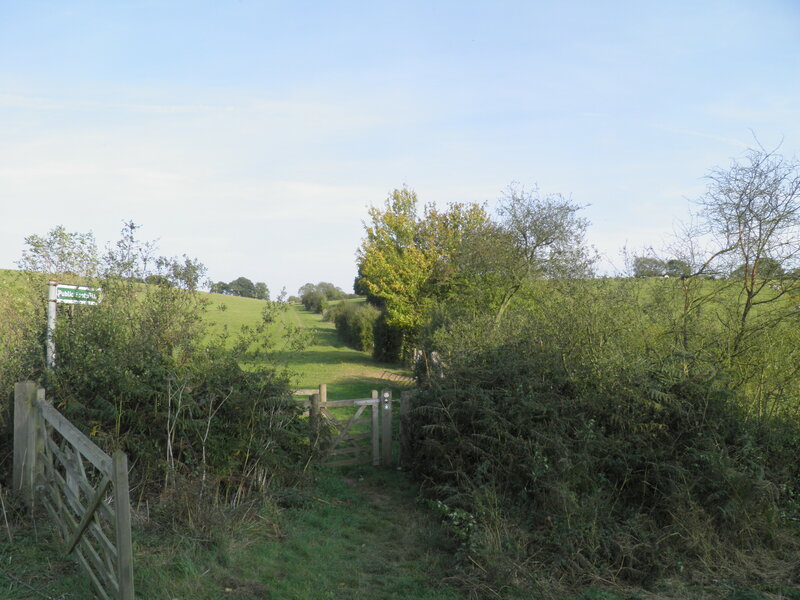 In the second field, your goal is the bottom right-hand corner where the path enters a narrow band of trees to arrive at a footpath junction. 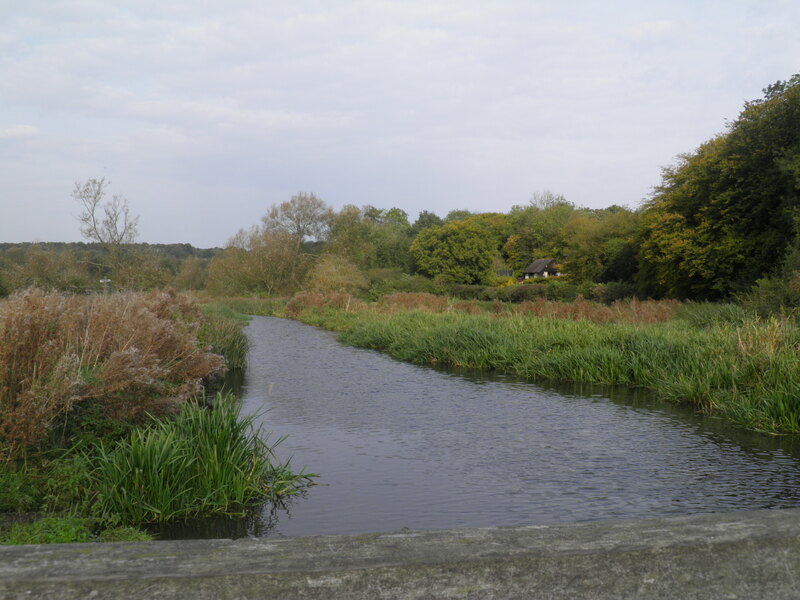 a low bank just above the old course of the river (which here forms the boundary between Buckinghamshire and Hertfordshire). Through a kissing gate, you emerge on a track in front of a pair of cottages. Almost immediately turn left on a track which gives onto a grassy path leading uphill towards to large cream house of Godringtons. At the top of the hill, follow waymarks across the drive to arrive in front of compact Sarratt church, in the hamlet of Church End, a good mile from the village it serves. keeping with the star-studded theme of this walk, the church was used as a location in Four Weddings and a Funeral. Take the gravel path in front of the church (signed ‘Chess Valley’) and on leaving the churchyard take the right-hand of the two paths, cutting diagonally across the high pasture. At the corner of the wood cross the small tarmac drive (next to delightful sculpted gates in the form of owls), continuing on the path towards Sarratt Green. A clear path through woods and across fields brings you out on the long linear green in the heat of Sarratt. The village here, built around the 500m long village green which you are at the south-east end of, developed under the name of Sarratt Green before it became the dominant part of the village, and the original Sarratt became Church End. John le Carré chose the village as the site of the intelligence services’ training school in his fictional world (and there are plenty of the sort of large country houses in the environs of the village which could fill that role). 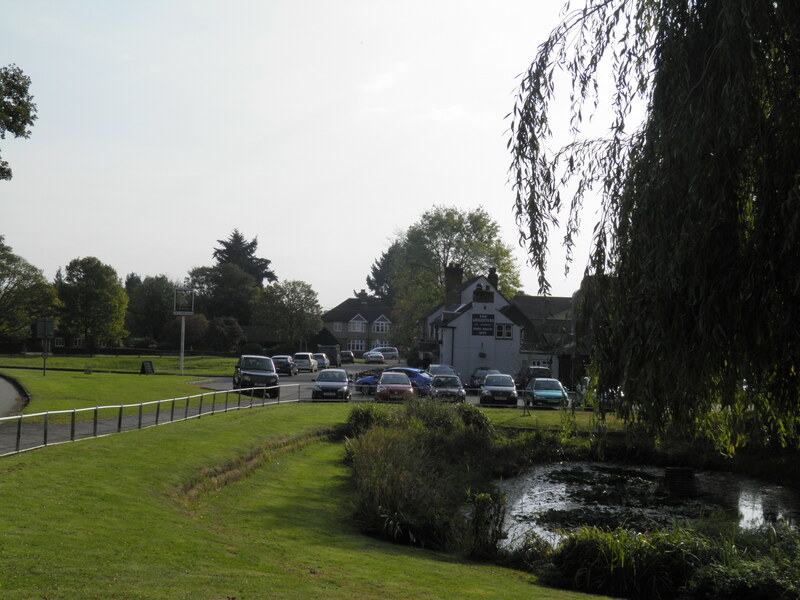 There is a village store to your left and the pleasant Cricketers pub to your right next to the willow shaded pond. Turn right along the road, keeping left past the bus stop and then turn left at the crossroads towards the King George V Sports Field. At the junction with The Briars, take the narrow path straight ahead (signed ‘Commonwood’). Past the tennis courts, keep straight ahead at a path junction, descending closely into a dry valley to reach a minor road. Turn left, then immediately right towards Commonwood. The road climbs gently through the woodland to a road junction in front of a vast mock-Tudor mansion. Turn right on the road through the scattered cottages and houses of Commonwood. At the junction in front of the Cart & Horses pub, continue straight ahead towards Penman Green. kissing gate onto a fenced path signed to Chipperfield Common. The path leads to the edge of a wood and at the junction here continue straight ahead (signed as the Easy Access Route) past the attractive pond. The path continues through the wood passing two fenced tumuli. Chipperfield Common is one of the largest commons in Hertfordshire, documented as a common since the Norman conquest. The tumuli (burial mounds) have been dated from the early Bronze Age (2300BC – 1000BC). Around 100m after the second tumulus, just before a signed route to the left, turn sharp right on a fainter path through the woods. Waymarks lead you out onto the road opposite a large manor house. Follow the road right for around 200m and at the bottom of the dip, turn left on path alongside the drive to Top Common. climb straight out again. At the top of the hill, you reach the corner of a hedged path. Keep straight ahead along this, past another path junction and out into open fields again. After 2 fields you find yourself beside the A14 dual carriageway in its cutting. Climb to the footbridge, cross and on the opposite side turn right. After a kissing gate, the path turns left to drop through a field of maize to a track at the bottom. Here turn right to reach Broadfield Farm, where you pass through the farmyard to join the A4251 on the edge of Kings Langley. 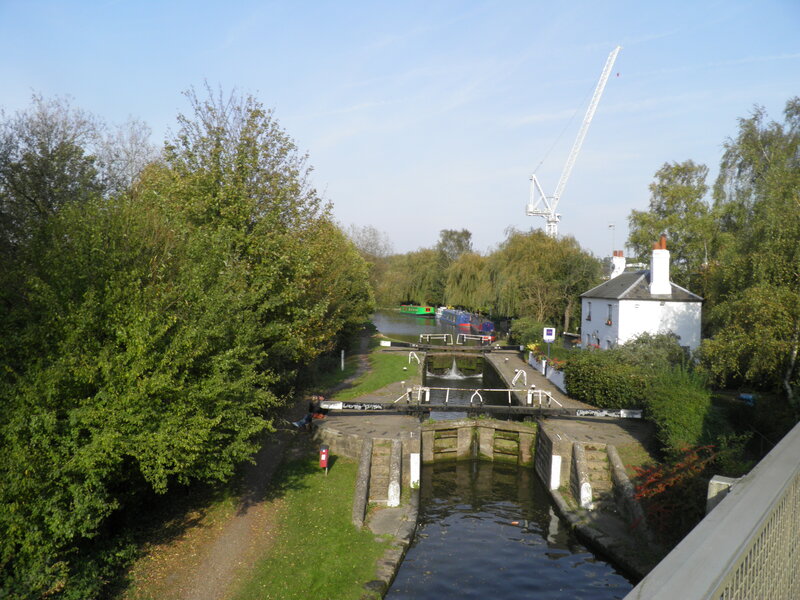 Station Footpath, which you follow downhill to emerge on a road next to the Grand Union Canal. Cross the road to follow the footpath sign on the other side towards the station. This takes you across the canal on a lower bridge beside the road bridge. From the other side, a narrow tarmac path leads uphill past industrial units to come out on the road almost opposite Kings Langley station. Excellent walk. Lots of interesting features, a very manageable distance and a half-decent pub en route (Cricketers). Highly recommended. Lovely walk. Remarkable to be in proper countryside accessible by tube! The Cricketers was an excellent half way stop, good food, real ales and craft beers.